We are in the middle of a beautiful, sun filled summer, which in England is short lived and gratefully received. Whilst our windows are filtering in light early in the morning to late into to evening many of us still spend the majority of the day in gloomy offices and at desks in front of dull screens. Personally I can spend hours tapping away at my keyboard when working from home and spend a huge percentage of my time sedentary and indoors. This modern technologically heavy lifestyle has direct, often negative effects on our health. Deadlines are keeping us from the sunshine. Light is not just light. Whilst there is a huge focus on green living, healthy eating and exercise the importance of positive exposure to daylight seems to have slipped from the wellbeing agenda. Many of us suffer from Seasonal Affective Disorder in the dark months, feeling depressed and low on energy. Come January I am usually binge eating carbs and taking Vitamin D supplements to tide me over till spring. 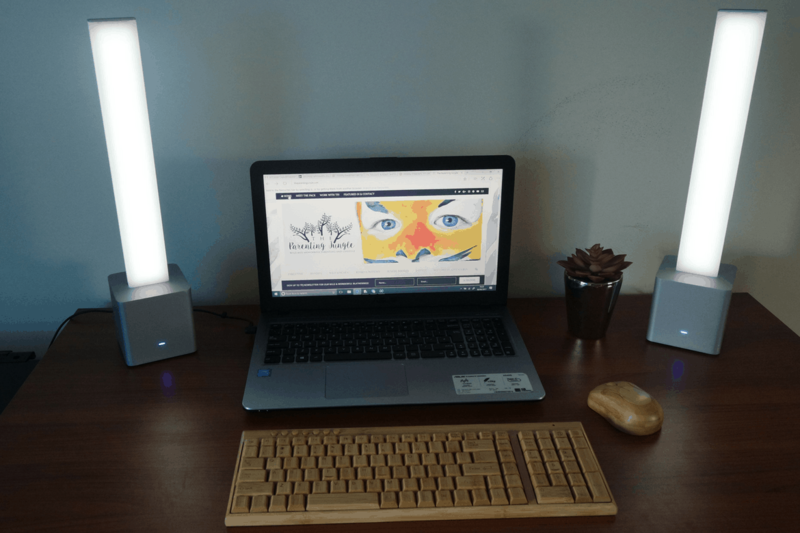 Unlike traditional SAD treatment light therapy which demand an hours focused usage each morning the Needlite offers a hassle free imitation of natural daylight to boost energy all year round. This improves productivity, performance and mood. Indoor light is just a fraction of daylight, is of poorer quality and lacks light from blue wavelength spectrum which stimulates our daytime production of serotonin and positive cortisol. You don’t just need darkness to sleep. Like most parents I am tired, nights are filled with broken sleep. If I am lucky. Children are not the only reason why our natural body clocks are muddled and half of us are not getting a good night’s sleep. Darkness is a signal for the body to increase its production of melatonin and when the sun rises serotonin is boosted, telling the body to get active. Our circadian rhythm depends on our ability to fill up on sufficient light and darkness every 24 hours. If not, our system gets confused. Make light work for you. The Needlite is an innovative, new generation desk lamp that has a sleek, modern Danish design. Made to a high quality the lights are simple to set up and are to be positioned in a symmetrical position, well balanced either side of desk. Standing 40 cm tall, this creates shadow free lighting from the low-energy LED lights for zero screen reflection. Packaging is of a premium design. The aluminium base offers dual touch to change intensity of light. On top of this there is also the option of using an iPhone App to control, monitor and personalize your daylight boost to give the user feedback on light consumption and usage. I found I could adjust the light to a comfortable level as I suffer from migraines so prefer a longer term low level intensity. Our bodies react instantly to light exposure in as little as 50 seconds. After two weeks of usage I find I am working more often at my desk, and my energy levels do feel higher. I suffer from ME and hope over the long term this will contribute to boosting immunity and raising my mood. A much more efficient option than my desk lamp I also find these a fantastic alternative to my light box when taking photographs! Depending on your location you can try a Needlite to see if it works for you and they come with a 2 year warranty. Note: We were generously gifted a Needlite in exchange for an earnest review.